Investors Slam The Brakes On Tesla, Time To Stay On The Shoulder? Valuation doesn’t matter, until it does. That’s the refrain I hear from countless analysts, investors and strategists when it comes to momentum or “story” stocks, where enthusiasm for where the company is going next overshadows the financial performance it can deliver now. Dozens of stocks have been carried by the frenzy of lofty expectations, and then suffered the fall when that sentiment changes. So the question is, did Tuesday’s third-quarter earnings from Tesla Motors TSLA -7.53% prick a bubble in the electric carmaker’s shares, or is the stock just refueling for a continued run higher? Jefferies analyst Elaine Kwei honed in on Musk’s remarks, noting that Tesla believes Panasonic will be able to meet the needs of an expanded agreement to supply battery cells. More important, Kwei writes in a report Wednesday, investors need to step back and look at the “tremendous milestones” the automaker has reached this year, including $2 billion in revenue over the last 12 months with Model S shipments picking up and a rise in gross margin from less than 10% to 20% and on target for 25% in Q4. Should You Let Your Winners Run Or Take Profits Off The Table? Steve Schaefer Forbes Staff Flat Tire For Tesla: Shares Slide After Earnings Samantha Sharf Forbes Staff How Facebook, LinkedIn, Netflix And Tesla Are Running The Rally Steve Schaefer Forbes Staff Tesla Beats Estimates, Traders Sell Anyway Mark Rogowsky Contributor The stock’s lofty multiple may look rich with respect to fellow automakers like General Motors GM -1.83% and Ford Motor F -2.13%, but Jefferies compares Tesla to growth companies in the technology space rather than the automotive industry and thinks discounted adjusted EPS expectations for 2017 imply a current earnings multiple between 26 and 32, not dissimilar from the 31 fetched by lighting products maker Cree and the 39 the market assigns to filtration technology company Polypore International PPO -1.94%. “[W]e think we’re only scratching the surface of things to come,” Kwei writes, noting likely 2014 highlights included initial shipments to China, the final touches on the company’s Model X SUV and design work on the planned lower-cost model that many point to as a critical component of Tesla’s future. But Tesla could very well continue improving from a bottom-line standpoint and lose its momentum as a hot stock. The divorce between fundamentals and the stock price that juiced shares on the way up can be just as prevalent on the way down. Goldman Sachs analyst Patrick Achambault acknowledges many of the same points presented by Jefferies, but takes a more cautious stance and has a $104 price target to Kwei’s $210. Even though Tesla’s Q3 shipments of 5,500 vehicles were shy of rising expectations, they still beat the company’s own forecast, Archambault notes, in what was the broad theme of the quarter. But remaining uncertainty around the real underlying demand for the company’s vehicles – masked by the lag in overseas deliveries and battery constraints – coupled with the sky-high growth expectations is what keeps Goldman wary. Tesla is also facing something of a high-hurdle effect, not dissimilar to that experienced by the likes of Apple AAPL -1.62% and LinkedIn LNKD -4.22%, where beating its own guidance is not enough for Wall Street analysts who have modeled out considerably higher growth. While the fundamental view seems to be more bullish than not, with concerns about valuation, chartwatchers are finally getting the retreat thy have been calling for. “Tesla is a momentum stock with a real story to tell,” says Auerbach Grayson technical strategist Rich Ross, but that is a blessing and a curse. Such stocks are “notoriously difficult to value” in a traditional fashion, he says, and there is a troubling pattern for traders falling back on technical indicators: a textbook Head and Shoulders top forming since August. Ross thinks a break below $150 would trigger a drop to the $110 area. “If this stock closes below $150, it cannot be owned,” he suggests, and even above that he’s hesitant to predict the uptrend that had the stock as high as $194.50 on September 30 will resume in earnest. “When it comes to high flyers like Tesla, I’m a big believer in the old adage, ‘Your first loss is your best loss,’” says Ross. Even with Wednesday’s decline Tesla shares are up almost 350% this year. The company’s share price has risen by 83% in the past year, and by almost 50% so far in 2012. Apple is now easily the largest company in the world by market capitalisation, at some $565 billion. It looms over Exxon Mobil, which is worth a mere $408 billion. Since the start of this year it has added $187 billion to its valuation, roughly equivalent to the entire market caps of companies like Procter & Gamble, Johnson & Johnson and Wells Fargo. Apple is larger than the American retail sector combined. It accounts for 4.5% of the S&P 500 and 1.1% of the global equity market (see chart 1). Some bank analysts have started to report America’s corporate earnings without Apple, because including the firm so skews results. Fourth-quarter earnings are expected to have risen by 6.7% from the prior year for companies in the S&P 500, but by a much more modest 3.6% if Apple is excluded, according to UBS. Around a third of all hedge funds own it, including big names like SAC Capital and Greenlight. Some have made very big bets. Citadel’s $5.1 billion stake in Apple (as of December 31st) accounted for around 12% of its equity portfolio. Many hedge funds that have done well in the past year owe much to this single position. The stock’s gains this year have not only boosted the spirits of shareholders but also brightened the whole equity market. 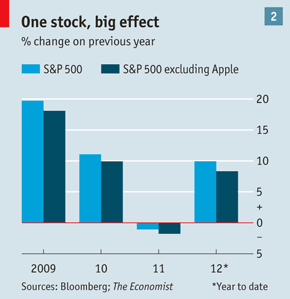 Apple is responsible for more than 10% of the S&P 500’s rise this year (see chart 2), and for 39% of the NASDAQ 100’s gains. No other stock has ever grown to have such a significant impact on an index so quickly, says Howard Silverblatt of Standard & Poor’s, a ratings agency. The share price keeps soaring. On March 20th, a day after Apple announced it would use some of its cash hoard (estimated at $97.6 billion at the end of 2011) on a quarterly dividend and a $10 billion share buy-back, its shares closed at a record high of $605.96. This is the first time in 17 years that Apple will pay a dividend. Dividend funds, which had not considered investing in Apple before, could pile in, potentially pushing the price higher still. Most analysts remain committed fans of the shares. Some claim that a $1 trillion valuation could soon be possible. The bullish case runs as follows. Apple has low penetration in the personal-computer and smartphone markets, and can hook millions more customers in emerging markets like China and Brazil. Although questions remain over how much of Apple’s innovation was due to its magician-in-chief, Steve Jobs, who died last October, the launch of the new iPad has calmed nerves somewhat. Apple is poised to enter new arenas like television and mobile payments. The firm still has a ton of cash to invest in new products and ward off emerging threats. Horace Dediu of Asymco, a data-analysis firm, has estimated that even after the dividend payout and any buy-back activity this year, Apple could still end 2012 with over $35 billion more in the bank than it had at the end of the previous year. With an historic price-earnings (p/e) ratio of 22, shares are not as dear as you might expect, and look even more attractive when the p/e is calculated based on forward earnings. Apple’s revenues are forecast to grow by at least 51% in fiscal-year 2012 and by 23% in 2013, according to Morgan Stanley. Some wonder whether the stock is headed into bubble territory. Apple’s p/e is much lower than that of stocks in the dot-com bubble; America Online’s was a ridiculous 154 in 1999. But contrarian thinking is thin on the ground. There is very little short interest in Apple. “Call” options, which give the right to buy Apple stock, are much more expensive than “puts”, which give the right to sell the stock, says Mark Sebastian of Option Pit, a consultancy. Of the 54 analysts who track Apple stock, only one has a sell rating, according to Bloomberg. Robert Shiller, a Yale economist and author of “Irrational Exuberance”, reckons that the “emotional attachment” to the Apple story and “wild” enthusiasm about its stock are reminiscent of a bubble. “You could play the bubble, because it might not be over yet, but I wouldn’t put money in Apple stock,” he says. Even if bubble talk is over the top, a higher share price is justified only if Apple continues to meet earnings expectations. That usually gets harder. The stocks of market-leading companies historically underperform once they have reached the top slot, since they are less nimble and more vulnerable to attacks by regulators and the press. It is harder to continue impressive earnings growth on a large base. Even a modest earnings miss could have a big effect on the share price, since more of Apple’s shareholders today are fickle traders. If there was a fall, it would ripple. Technology investors, which have a higher concentration of Apple in their portfolios, are the most vulnerable. Apple makes up more than 18% of PowerShares QQQ, an exchange-traded fund with heavy exposure to technology stocks, for example. More unsettling are funds that have strayed into buying Apple against their mandate, including some mutual funds that are supposed to focus on smaller companies. “If Apple has a wobble, you could see it dictate broader market movements,” says Alec Levine of Newedge, a broker. Hedge funds could be among the biggest losers. They look clever now for buying a stock that has seen such a rise, but they will look dumb if they lose money when it falls. Some may question whether they should earn such high fees simply for buying into the world’s most valuable listed firm. Where’s the genius there?